Roger Federer actually lost on Sunday against Borna Coric in the final in Halle. The Swiss won a tournament in Stuttgart, and the next week, he was a little flat, but it’s not like he was all bad. In the final, in the third set, Coric kept digging and nailing the winners, grabbing it 6-2. The Croatian has improved a good amount this year, especially in the last six months. He has only won two titles, but still, he reached the semis at Indian Wells, and he nearly upset Federer on the hardcourts. This time, on grass — which Coric never loved — the strong young man went for it. And that is why he won. Now, even though Coric is rising. It will take him even more time, because he can still back off, and that is why he didn’t go deep at Roland Garros. However, not only did Coric upset Federer, he also knocked down Alexander Zverev. That was very significant. Now he is ranked No. 21. It will be fascinating to watch next week. 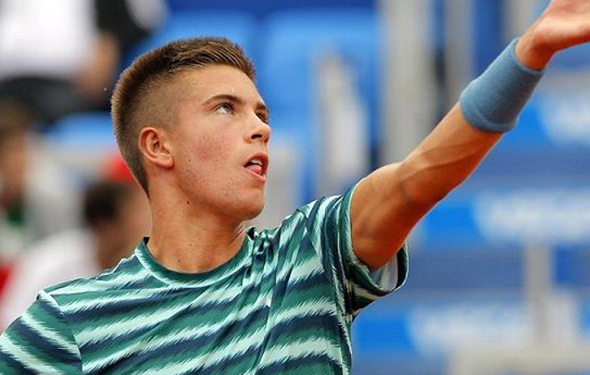 By the way, Coric has yet to reach a second week at the Slams — ever. It is time for him to step it up. Last year at Wimbledon, Federer won the title once again, not even dropping a set, including battering Marin Cilic in the final. Can ‘Rog’ win it again? For sure, he is the favorite, according to Novak Djokovic, who just reached the final at Queen’s. But while those two can win Wimby again — combined that would be 11 titles, eight for Federer and three for Djokovic — that doesn’t mean that someone new can snag it. Perhaps Cilic, for the first time on the beloved grass, Rafael Nadal, who has won here before, but generally, after he wins Roland Garros, he has played so many matches, a ton of matches, on clay. Maybe his legs and arms are OK, but he pulled out of Queen’s. So, perhaps, during Wimbledon, he will break down, with a same old injury. But let’s hope not.